Our custom Tampa decals come in any size, any shape and many materials! Our Tampa decals are truly customized and limited only to the extent of your imagination. From multi-colored, contour cut vinyl Tampa decals to static cling and clear Tampa decals, the possibilities are unlimited when you choose Good Guys Signs for your custom Tampa decals. Our custom Tampa decals are printed using a state of the art, 8-color, Epson 1440 dpi printer, or a fantastic HP FB 700 when white ink is needed. So your Tampa decals are as vibrant and eye-catching as the latest technology can produce. 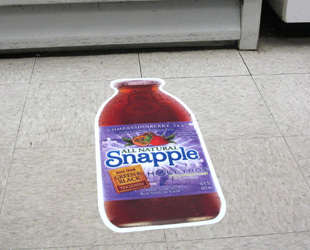 Whether you're looking for simple square Tampa decals that mark an occasion or more durable, laminated Tampa decals to be applied to your manufactured products, we have the team and technology to create exactly what you're looking for. With a truly limitless list of design possibilities, our custom Tampa decals can be used to serve just about any purpose you can ponder. 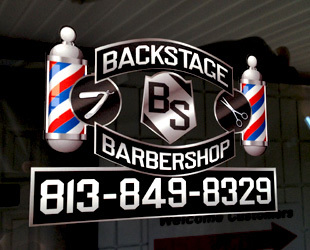 A popular new advertising area for decals is rear window decals. These are usually made with white vinyl. With Good Guys Signs advanced printers and cutters, we can cut intricate shapes in full color, whatever your logo or message requires. 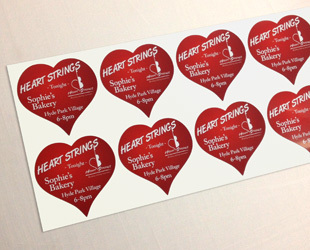 When it comes to custom decals, we can deliver virtually any look you have in mind. Our custom Tampa decals come in any shape or size that you can design. for full pricing and product details! Custom Tampa decals can be used for so many business and personal uses: Corporate branding campaigns, guerilla marketing strategies, and so many more. Regardless of the purposes for which you intend to use your Tampa decals, we have the talent and technology to bring your designs to life in any size, any shape and on any material. As previously presented, the possibilities are virtually endless - and it's true. Come in with a design of your own or work with one of our in-house graphic designers to create your custom Tampa decals. We have the tools and the resources to produce exactly what you're looking for. With 8-color, 1440 dpi printing technology at our command, we produce high-quality and professional results, and we have the fastest turnaround time in Tampa Bay. 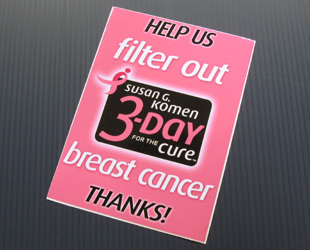 You name it, and we can have your custom decals available to you in virtually no time at all. 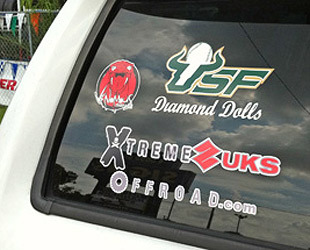 Custom Tampa decals can come with different adhesives. 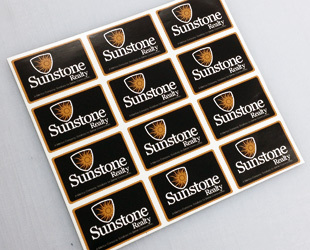 We have low-tack decals, repositionable decals, and permanent decals. Custom Tampa decals also can come with many different laminates. Dry erase is great for entering and changing data. A matte overlaminate is best for interior viewing in fluorescent lighting. Gloss and semi-gloss give a sheen to the Tampa decals. We provide custom decals in Tampa, Florida as well as St. Petersburg, Clearwater, Largo, Palm Harbor, Brandon, New Port Richey and throughout Tampa Bay. We also ship our decals throughout the United States. When it comes to custom decals, Good Guys Signs is a great place to buy high quality decals at a low price. © Copyright 2012 Good Guys Signs. All rights reserved.